It’s time for Shortventure Contest 2018! The idea behind this contest is to encourage more people in the community to make adventure games. We also want to encourage people who haven’t made IWBTG fangames before, or people who struggle to finish long fangames, to try and finish a game as best they can. You may work on your game for 1 month, from now until November 1st. You don’t have to use the entire month. Games should be uploaded to Aronax(Jamie)#3159 in DM’s on Discord by November 1st. After the contest, you are free to keep working on your game and to publish it whenever you want. The theme for this year’s contest is Fear! Participants should try to incorporate fear into their games somehow. Having a theme is meant to give game makers a starting point and some inspiration. It’s also fun at the end of the contest to see how everyone interpreted the theme differently. So think outside the box and use whatever creative interpretation you like! Jump scares are not allowed in your game. Even though the theme is fear, sudden loud noises and scary images suddenly appearing are not allowed - there are other ways to use the theme “fear”. 2. Games should have around 20 minutes - 1 hour of gameplay. It’s okay if your game is longer or shorter, this is just a guideline to make sure people finish on time. 4. Games should be “adventure games” - we don’t have an exact definition, but use your judgement based on other adventure games. Just don’t submit a pure needle game or Miku avoidance. 5. You may work by yourself or in a team of two. 6. Games should have debug mode enabled, so judges can progress if there are bugs or problems. 7. Put your complete game in a folder and include a readme. We are planning to release results around 1 week after the contest ends (it may be 2 weeks if there are a lot of submissions). Each game will be given ratings in the following categories: Overall, Theme, Level Design, Atmosphere, and Audio. Participants will also receive written feedback on their game from each of the 6 judges: Aronax, Kurath, Naloa, Pieceofcheese87, Swordslinger, and Wolfiexe. This year, we have cash prizes! The prize categories are as follows. Participants are limited to winning no more than 2 categories. Teams of 2 who win prizes can split them amongst themselves. 1st place: $100, 2nd place: $50 - To qualify as a newcomer, you must have never made a fangame before, including any collaborative projects such as Spook Jam. $50 - Creative use of the theme, and how well the theme is incorporated in the game. $50 - How well the game feels and looks, and creates an immersive and compelling experience. $50 - A creative mechanic, and how well it is used in the game. $50 - How well a boss (or bosses) are made and how well they fit in the game. $50 - A well-made and funny trap in the game. This does not mean the whole game has to be a trap game, the prize is just for the best single trap. Here are some videos of games from last year’s Shortventure contest to give you an idea of what to expect. If you’re a newcomer, don’t worry if your game isn’t as good as these! If you are relatively new to fangames and would like to join in on this contest, Klazen has a written tutorial, and Patrick has a few tutorial videos. You can also ask for help about anything in the Discord server - we are happy to help! Put saves on the ground. Use plenty of sound effects. Get someone to play test before submitting it. Theme can be interpreted in any way you want. Doesn't have to mean one specific thing. Consider having a volume check. Think outside the needle genre. Make sound stereo not mono. Make the music fit the screens. Avoid generic random flying spikes. So, if you want to try your hand at making a short IWBTG fangame, you’re more than welcome to join! Good luck to all participants, and happy game making! Don't ask me to test bosses. It will always be a no. 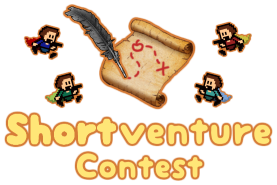 The second iteration of the Shortventure contest is now complete! It was great to see everyone's hard work for the month of October as it led into Halloween, the fitting conclusion for our frightful theme. The results are now in, with 16 games of different shapes and sizes crossing the finish line, and many that were almost there that will hopefully make it the distance in the weeks to come. An impressive arrangement of games came through this year and our judging team couldn't be more pleased with what they saw. Spooky story-based sojourns alongside awesome action-packed adventures, concise chilling capers and extended eerie enterprises, finished frightening forays and foreboding fragments of what's yet to come; the variety was astonishing and the creativity put forth by the participants this year is truly commendable. The discord server will remain open for discussion of the games, as well as to assist with additional feedback and assistance as needed. We'd like to encourage makers to post when they've uploaded their games so people can get in there right away, and we'll be adding a #streams channel to the discord to let each other know when the games are being played. There were many ambitious projects that didn't quite get completed and we'd like to maintain the momentum to see these amazing games see their completion. Additionally, it will be re-used as needed for future contest and events, so hang around and you may catch a whiff of what else is in store. Thanks everyone for participating - either by making a game, testing someone else's game, helping out in IWC gamemaking/gamemaking help in the discord or just cheering on their friends and fellow community members!